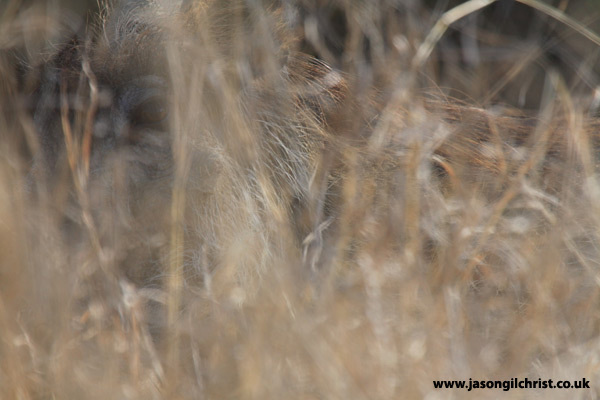 This image highlights the dangers of walking in the savannah and how well camouflaged warthogs are within the grass. Boars (males) can have spectacular tusks, which they use in fights, and they are a fantastic weapon versus predators. Males also have large 'warts' on the side of their flat, hard faceplate; these act as shock-absorbers in the head-bashing and tusk-wrestling that they engage in. Nevertheless, they are well camouflaged within the savannah grassland. Common warthog (Phacochoerus africanus).